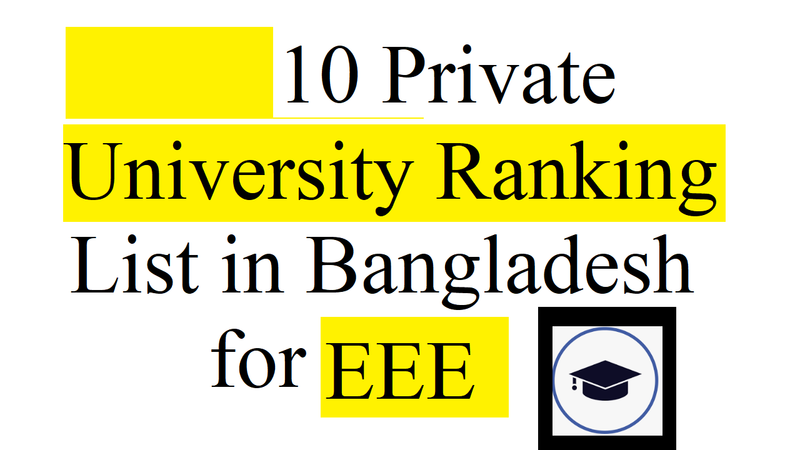 Best Private University Ranking list in Bangladesh for EEE 2018- 2019. Those who complete their 12th class in Bangladesh aim to join one of the reputed engineering institutes to get a degree. Electrical and Electronics Engineering (EEE) is the most sought-after choice students opt for, out of the many engineering branches available. And they like to get admission in the public universities and in case of failure to do so; they look for the private university as the second and alternative choice. As there is a variety of reasons, many students prefer electrical engineering. Those who are EEE involve in a wide variety of technology. These may range from huge global positioning systems which can pinpoint the location of a moving vehicle to gigantic electrical power generators. Because the degree has huge demands, the best private universities with the course have higher demand as well. When you’ll complete your EEE graduation from a top private university, you can work in atomic power plants, hydel or thermal power plants. Also, there are ample jobs both in the private and public sectors. These do not only include railways, civil aviation and electricity board but utility companies, electrical design and consultancy firms and all types of manufacturing industries as well. What is the Top 10 Private University in Bangladesh for EEE? As you’re looking for the best private university in Bangladesh for EEE degree. We’re here with the top-ranked Bangladesh private university along with their details information so that you can get your one easily. This is based on world ranking like impact rank, excellence position, etc, these BD individual private university rankings. Because there are some blacklisted private universities in Bangladesh, you should be aware of them. Now, if we talk about these top 10 private university lists then it’s provided by UGC. Well, let’s know what they are the best private universities in Bangladesh for pharmacy. AUST is one of the best private universities for EEE with the International Association of Universities (IAU), University Grants Commission (UGC), Bangladesh and many other National and International Education Institutions and Professional bodies, the AUST maintains close collaboration. The Dhaka Ahsania Mission is the founder of the AUST, which was established in 1995. Established by a group of philanthropists, industrialists, bureaucrats and academics, the North South University (NSU) is the first private university in Bangladesh. Under Private University Act-1992, the government of Bangladesh approved to the establishment of North South University in 1992. After formally inaugurated on 10 February 1993, NSU is another best private university for EEE. This is not only comprised of a group of eminent industrialists but, prominent patrons of education, notable philanthropists, widely experienced academics and senior civil servants of the country. It’s bringing in a revolution in the lives of business and individuals while using Electrical and Electronic Engineering tools, such as mobile phones, digital TV, generators, motors, computer, and wireless networking. As the university is to foster the national development process through the creation of a center of excellence in higher education that is responsive to society’s needs, it’s able to develop creative leaders. One can opt for a guaranteed bright career in the corporate genre as the courses are highly proficient. So, BRACU is another best private university for EEE. Independent University Bangladesh is one of them who want to be a globally renowned Electrical and Electronic Engineering department for teaching, research and innovation. Also, IUB wants to produce high-quality graduates with knowledge and relevant skills to meet the demand of the local as well as the global market. As they are creating an excellent environment for partnership, research and development activities in collaboration with academia and industry, they are another best private university for EEE. When EEE department started its journey in January 2005, they have been able to establish ourselves as a leading EEE department in the country. During the recent years, the profession of electrical and electronic engineers has truly become global. With academia and industry, they are another best private university in Bangladesh for EEE. United International University emphasizes not only on teaching and research activities but also on the extracurricular activities and to upgrade ethical and moral values of the students. Apart from these, there are outstanding faculties, well-equipped labs, a rich library with spacious study room of excellent environment and lastly. When the university mainly believes in imparting technical, pioneering, equipped, and computerized education to their students, they can make their place stronger in the internationally competitive professional market. It has progressed by leaps and bounds both as an institution and the programs it delivers to the students since the commencement of its journey in 1994. In their chosen fields are focused to impart quality education and to train the students to become leaders of tomorrow. In the year 2009, The Department of EEE of Daffodil International University (DIU) was established. But, it’s not only one of the largest departments of the University but it’s still growing very fast. The department started its journey with 27 students after getting approval from the UGC of Bangladesh. Founded in 2003 under the Private University Act 1992, GUB is one of the leading private universities in Bangladesh. GUB lays stress on quality education imparted by a galaxy of highly qualified, dynamic, dedicated, and well-experienced faculty members with global exposure as a modern, dynamic, and innovative institution for undergraduate and graduate students. That’s why with academia and industry, they are another best private university for EEE. They are with academia and industry; they are another best private university for EEE those who are graduated in this program. While providing solid foundations in Mathematics and physics, this program offers a rich variety of electrical and electronic course. This is because they are one of the best among other university students.